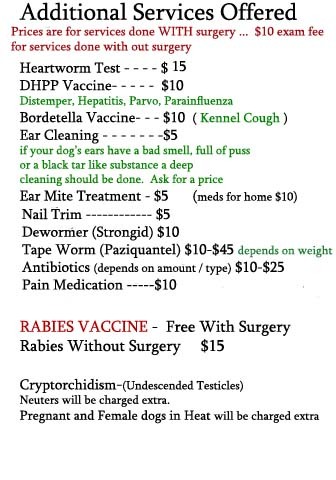 The prices of females dog spay had increased please consider the price table below. The prices listed below are for surgery patient only . Free rabies vaccine is given at time of sugery. Rabies vaccine is given if dog is over 3 months of age. Anesthesia,Cleaning,fluoride treatment and Extraction of only only unstable loose teeth. CBC-with dif, TP, AIB, Glob, ALT, ALP, BUN, CRET, GLUC..